Did you know that your cycling shoe is the most important piece among all your cycling gears? Forget about the kit, sunglasses, gloves and socks. There are three contact points between your body and the bike; your palms, pelvic bones and feet. The feet are the most important amongst the three. It’s where you’ll transfer all the power from your legs to the pedals to move the bike, typically at a rate of around 80-90 rpm. You’ll probably be turning the pedals about 4000 to 5000 times for every hour of cycling. Hence, choosing the right pair of cycling shoes that suit not only your style of riding but more importantly the shape of your feet is, crucial. Whether you’re after a beginner, value for money or performance cycling shoes, I’m sure you’ll find one that best suits you. 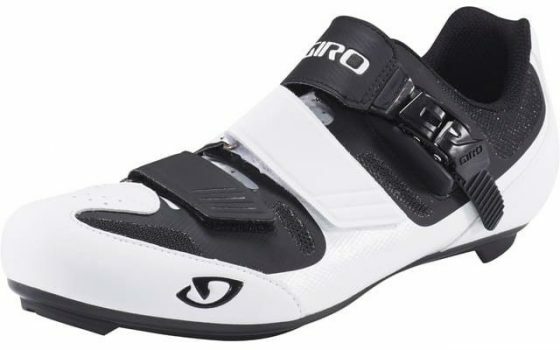 Giro is one of the brands you seldom go wrong with cycling shoes. Even though the Giro Treble 2 sits on the entry level range, this shoe still packs plenty of features such as the Aegis® anti-microbial EVA footbed. It comes with a clean and modern design. The 3 Velcro straps, which is slightly wider than other brands, are strategically placed to provide a snug, yet comfortable fit. Pearl Izumi was started by a Japanese man named Kinji Shimizu. Today, it’s based out of Louisville in Colorado. The Men Select is Pearl Izumi’s entry level road cycling shoes. It’s now in its 5th iteration and it has undergone major updates from its predecessor. The nylon sole is now stiffer with a stiffness index of 6 which is ideal for beginners and those doing century/audax type of rides. A new composite material is used for its upper layers and it provides better breathability especially on those hot summer days. This material is also able to adapt the shoe’s shape to your foot overtime to provide a snug fit. Don’t be fooled by its entry level status, this shoe looks cool and sleek. 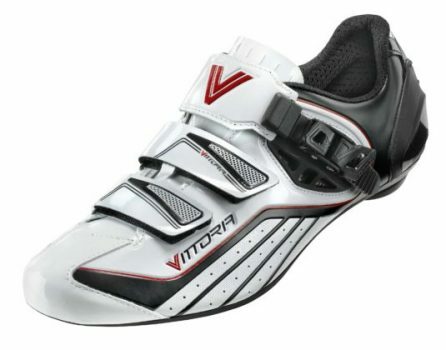 Don’t be confused Vittoria Shoes with the Vittoria tires. They’re different brands and companies. Vittoria Shoes is probably newcomer to the U.S. market, but they’ve been around since 1976 and hugely popular in Europe. Their shoes has been worn by World Champions such as Stephen Roche and more recently, Thor Hushovd. The Zoom is their latest entry level cycling shoe for the U.S. market. Unlike many other entry level shoes, it uses a combination of 2 Velcro straps and a ratchet buckle that allows for a more precise fit. The Fizik R4B Uomo sits in the middle of Fizik’s road cycling shoes’ range, below the top level R1 and above the entry level R5 series. 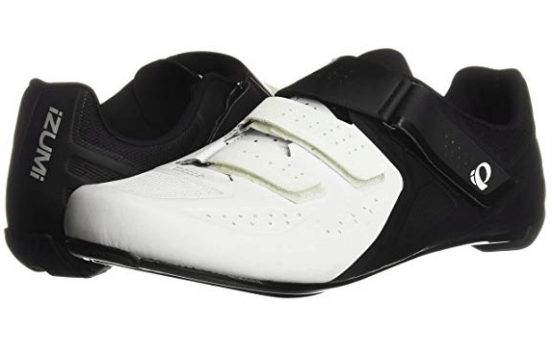 As with most mid-range cycling shoes, the sole is made from injected carbon-fiber. This is just another fancy terms for a sole made from a mixture of carbon and plastic, sort of a midpoint. As expected, it’s not comparable to the super stiff carbon, but it’s still plenty still for most recreational cyclist or for long distance cycling. The Shimano RC-7 is the next model down the line from the range topping S-Phyre RC9. It’s a mid-range performance road cycling shoes. Good enough for most cyclists except for the pros. One of the first thing you notice about the RC7 is there’s only a single BOA dial compared to the S-Phyre and there’s an additional a velcro strap. While this still provides a very good fit and comfort, the price is halved and it’s more affordable to its big brother, the S-Phyre. While most shoes today have either a matte or leather top finish, the RC7 has a gloss finish. There are plenty of room for ventilation with perforations all over the top which will be useful on hot summer days. The Apeckx 2 is Giro’s mid-range road cycling shoes. It sits just a level below the Factor and Empire series which are super stiff and lightweight. The biggest difference is in the sole. The Apeckx 2 uses a composite nylon sole rather than a super stiff carbon sole made by Easton. It’s still pretty stiff with good power transfer properties but at a significantly lower cost. Hence, it’s more affordable to the majority. There are two variations; standard and High Volume, which is essentially the wide feet version for those who are looking for a bigger toe box. The Torch is Specialized’s mid-tier road cycling shoes. There are 3 models within the Torch family itself, the 1.0, 2.0 and 3.0. The 1.0 is the lowest end model. As you go higher up to 3.0, the main difference lies in the sole construction. The 1.0 uses a carbon composite sole, while the 2.0 has a carbon fiber sole and 3.0 uses a stiffer FACT carbon sole. However, they’re not as still as the top end S-Works 7. Another major difference lies in the fit. As the Torch isn’t a high performance shoes designed for racing, it has a more relaxed fit, especially around the toe box and heels. If you’re looking for cycling shoe that provides all-day comfort, this could be a good option to consider. The Elite sits just below the top-end P.R.O. in Pearl Izumi’s road cycling shoes lineup. Many of its features are actually trickled down from the P.R.O such as the carbon soles and BOA dials. It’s a vastly improved version of its predecessor, the V4. Taking feedback from cyclists, Pearl Izumi has made significant changes to the shoe’s body to provide an improved balance between fit, comfort and stiffness. If you’re after a mid-range cycling shoe that is plenty stiff, you’d be glad to know the Elite has a stiffness index of 13, matching some of the top range shoes from other brands. The Specialized S-Works 7 follows on from the hugely successful S-Works 6 shoes. 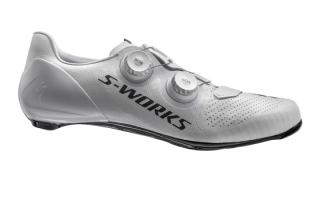 The S-Works 7 has undergone major changes on both the upper parts and its sole. The upper now uses a new mesh Dyneema material which improves breathability. It also uses the new S3 BOA dials, which is exclusive to only Specialized. Additional cushioning are added around the heels area to avoid nips and rubbing, which was common in its predecessor. Stiffness wise, the S-Works 7 is on another level all together with a stiffness index of 15, 2 notch up from previously 13 for the S-Works 6). This is definitely among the best pair of high performance shoes money can buy. The Shimano S-Phyre RC9, pronounced as S-Fire is Shimano’s top of the line road cycling shoes. While it’s not the lightest among its competitors, it’s Shimano’s lightest shoe ever. A pair of size 42 weighs in at 486g. Replacing the R321, the S-Phyre comes with major improvements especially on the closure system. Gone are the plastic ratchet buckles and they’re now replaced by two BOA dials. With these BOA dials, you can expect a precise, tight and yet comfortable fit for your feet. Another major improvement is the heel cup which was a major downer for the R321. Shimano has completely redesigned the heel cup and it now feels snuggier, similar to the Specialized shoes. Look closely enough and you’ll see that the Giro Factor Techlace utilises all three closure systems. There is a BOA dial, velcro straps and laces. And there’s a reason behind this. The previous Giro Empire that comes with laces proved to be a popular shoe when it was first launched. While it’s nice aesthetically, the majority of cyclists complained that they can’t adjust it while riding. With the Factor Techlace, you now have the best of both worlds. At the top, the BOA dial allows for a precise fit through an adjustable 1mm increment in both directions. The Fizik Infinito R1 replaces the popular R1B which is worn by top pros like Philippe Gilbert and Geraint Thomas. It’s now the Fizik’s premium road shoe offering starting from the end of 2017. 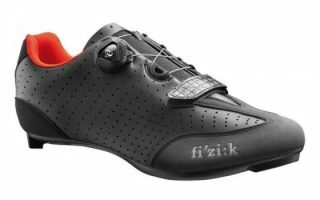 With the Infinito R1, Fizik has completely redesigned the top sections of the shoe. 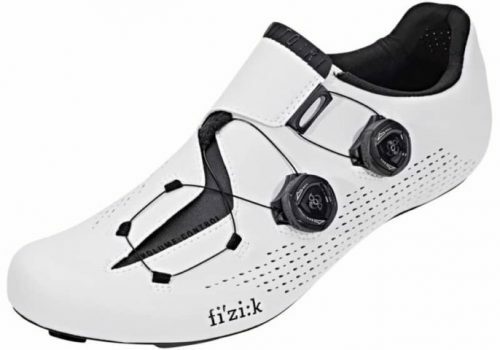 It uses two new closure technologies which Fizik calls the Dynamic Arch Support and Increased Volume Control, aimed at providing an improved fit and increased comfort level. The Surge Pro is Giant’s latest and premium road cycling shoes. It’s been worn by Team Sunweb riders throughout the 2018 season. It features an innovative system called the Exobeam sole, where the forefoot and heel is connected by a beam of carbon fibre. This design allows small movements in the feet around the pedal stroke where Giant claims to reduce the strain on the knee and ankle joints. Fit wise, it’ll fit most feet shapes thanks for the Exowrap feature. Giant places the BOA dials slightly towards the shoe’s center where it will provide a snugger fit and minimizes feet numbness especially on long rides. Fit is the most important factor when it comes to buying cycling shoes or any cycling clothing. As you’ll probably have noticed, some have a narrow feet while others have a wide feet and some fall in between. Besides the standard sizing, you’ll sometimes come across the letter E behind it. For example; 42E. E indicates a wide width. For your reference, there’re other alphabets for the width; B (extra narrow), C (narrow), D (regular), E (wide), EE (extra wide), and EEE (triple wide). Unlike running shoes, cycling shoes only uses the E sizing to avoid having too many variants of the same shoe. 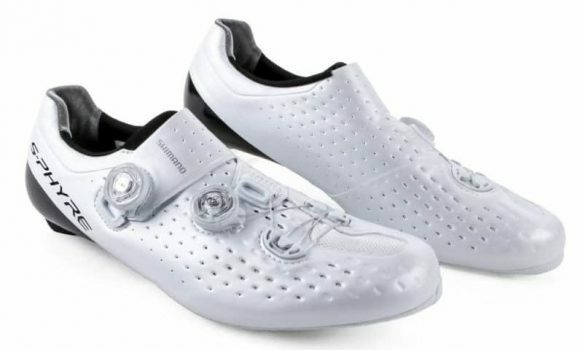 There are 4 types of closure systems used in cycling shoes today. Each one has its own pros and cons, but ultimately they all have proven to function well and be reliable. Manufactured by BOA, these lightweight dials are mostly found in high performance cycling shoes aka the expensive ones. They’re designed to provide you with a very precise fit. Each turn of the dial in either direction adjusts the fit by only 1mm. Should they get damaged, you can easily replace them by yourself. Just remember to buy the right ones as there are many variations of the BOA dials. The downside is these dials don’t come cheap. Ratchet buckles used to be very popular before BOA dials came to the picture. They’re sturdy, reliable but doesn’t offer the precision that BOA dials do. If you happen to break these buckles, chances are you’ve got to get a new pair of shoes as the replacement buckles are not easily available. These have been around for a long, long time and continue to do so until today. They’re lightweight yet durable and are unlikely to get damaged if you crash, unlike the ratchet buckles or BOA dials which could break apart. While the velcro straps provide a strong and reliable hold of your foot, their precision is nowhere near a rather buckle or a BOA dial. 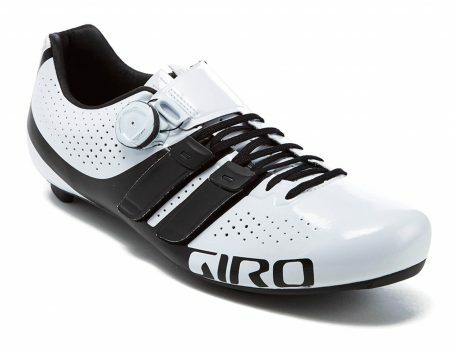 The trend of laced cycling shoes was started by Giro about 3 to 4 years ago. This system is the lightest among all the other three and provides a very snug fit. However, due to the nature of laces, you can’t adjust them on the fly. All high performance cycling shoes comes with carbon soles. Mid-range shoes typically use either a less stiff carbon sole, or a mixture of plastic and carbon sole. Sometimes, they’re referred to as carbon reinforced or carbon injected. Beginner cycling shoes are mainly made of plastic soles, which puts comfort over stiffness. Take note that in some cases, it’s not necessary to buy a pair of cycling shoes with the stiffest sole. Some cyclists have complained of feet numbness and pain due to a very stiff sole. These are lightweight, stiff and obviously expensive. Within carbon itself, there is a rating to indicate its stiffness. The higher than number, the stiffer it is. Anything from 11 to 13 is used in high performance shoes, while 8 to 10 is for mid-range. Mostly found in low to mid-range shoes, these are comfortable for most cyclists, especially if you’re into long distance cycling. They’re heavier but much cheaper. All road cycling shoes are designed with ventilation in mind. This is achieved through mesh holes in the first third of the shoes; either at the top, front, bottom or a combination of them. If your feet get sweaty fast during summer, look for a pair of cycling shoes with more ventilation. Don’t worry about too much getting cold feet during the winter if the shoes has too much ventilation. Just use a shoe cover and you’re all set. The type of cycling shoes you need depends on the type of pedals you currently have. SPD (2 holes). Also known as the SPD (Shimano Pedal System), today it’s widely used in mountain biking, commuting and touring shoes. The recessed cleat design allows for easier walking. SPD-SL (3 holes). This is also known as the Look style system. 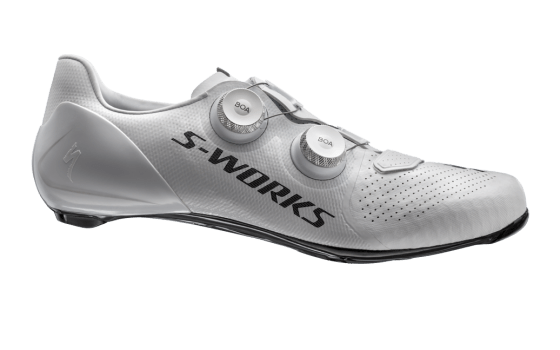 It’s widely used in road cycling shoes because it’s more stable and provides efficient power transfer compared to the SPD system due to its wider cleat design. Speedplay (4 holes). This is seldom found in any cycling shoes. Only Speedplay pedals uses a 4 holes system. In order to use Speedplay pedals, you’ll need a base plate that convert from 3 to 4 holes. Speedplay pedals allow for full customisation and fit in all directions. This is probably the main consideration for most of us when purchasing. So here’s a run down of what you can generally expect from the various price range. $300 upwards. These are high performance cycling shoes used by all the professional cyclists and most of the serious recreational cyclists. They’re lightweight, usually weighs below 500g (size 42) per pair and have super-stiff (sometimes too stiff for some) carbon soles. $150 to $300. 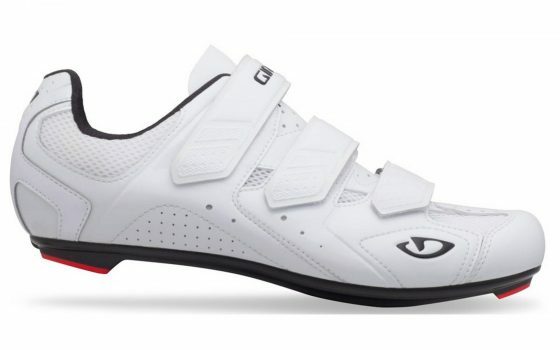 These are mid-level shoes aimed for recreational or long distance cyclists. They usually weigh between 500 to 600g (size 42) per pair and have a composite sole. Basically that’s a mixture of carbon and plastic. Below $150. These are entry level for beginner cyclists. They’re heavier, usually upwards of 600g per pair (size 42). The sole is made of plastic which puts comfort over stiffness. 1. Why do I need road cycling shoes? A pair of cycling shoes keep your feet firmly locked over the pedals. When you’re clipped in, this allows for efficient power transfer between your feet and the pedals, especially if you’re riding hard or uphill. Fitted and adjusted properly, the ball of your foot should be on top of the pedal spindle. This allows you to engage all your legs muscles, quadriceps, calf and hamstring when pedaling. When you use flat pedals, you only engage your quadriceps as you can’t pull the pedals up because your shoes are not clipped into the pedals. However, if you only ride short distances, less than 10 miles, there’s no need to get road cycling shoes. 2. What are the advantages of carbon fiber soles? Carbon fiber soles are usually found in top level performance shoes. They’re very lightweight, stiff and provides a very efficient power transfer as compared to plastic soles. But this also means that they’re expensive. And that’s where a carbon-injected or carbon composite soles come into picture. They’re a mixture of plastic or nylon with carbon fiber. While not as stiff and light as carbon fiber soles, they’re more affordable and usually found in mid-range cycling shoes. 3. 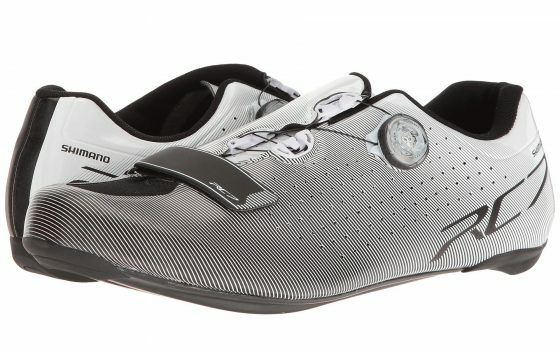 How long would it take for me to break in my new pair of cycling shoes? It depends. There’s no definite answer to that as there are various factors involved. How often you ride and how long you ride will ultimately determine the break in duration. From my own experience and speaking to other cyclists, it would typically take at least 20-30 hours of riding for you to feel comfortable in your new pair of cycling shoes. 4. Can a female wear a male's cycling shoe? Yes you can. In fact many female cyclists do that. However, if you have narrow or small feet, it’s advisable to get a female road cycling shoe. They come in smaller sizes from 35 onwards and the shape of the shoes are designed to mimic a woman’s tapered foot. Not all brands have a women specific shoe. The few that do are Sidi, Giro, Fizik and Specialized.